In the latest issue of the music magazine Mojo, there's an article with the title "Elvis' 'official bootleg' label celebrates tenth birthday!" I only read it the other day, and thought it interesting as it gave me the answer to why no tracks from FTD records are available as individual downloads. Talking about the upcoming Standing Room Only release, Ernst Jorgensen reckons that "Well annotated, glossy packaging is the key," and that "This kind of project is not really downloadable. I want to maintain Elvis's legacy as something you acquire and keep in your home." I can't help thinking that this is a somewhat old fashioned way of looking at things. And contradicting too, as a lot of Elvis albums, among them the 50's box set (produced by Jorgensen no less), are in fact available as downloads at iTunes Store. As for "well annotated, glossy packaging", yes, that's certainly true when it comes to the classic album series. But the same can't be said about the FTD 5" albums, where "lack of information" is a better word to describe them. In the above mentioned article in Mojo, Roger Semon explains to the readers that the Follow That Dream label was set up "for distribution by fan clubs only...in return for their cessation of bootleg sales." But the bootlegs keep coming. And many of them offer "well annotated, glossy packaging," featuring informative booklets with a lot of pictures. Why FTD doesn't follow suit when it comes to, for example, the soundboards, I can't figure out. I think I read sometime that the reason was that the people who buy concerts already know all about them. But collectors want all the details, so that can't be true. Do you know why? PS: Roger Semon also tells Mojo that the release he is most proud of is The Jungle Room Sessions, and I think he should be. It's an outstanding release. But isn't it about time we got the first FTD box set? I'll vote for the one my brother likes to call: Behind Closed Doors - the complete 1976 studio sessions. Whenever a new album and its track listing is announced I start thinking about the pros and cons with that particular release. The upcoming Standing Room Only is no exception. First, I think Ernst Jorgensen and his crew are doing the right thing by concentrating on the studio outtakes on the second CD. For example, I'd rather listen to the creative process of Elvis working himself through "Separate Ways" than hear him singing seven nearly identical live versions of "Never Been To Spain." Also, and maybe a bit ironically considering FTDs view regarding the bootleggers, the choice to include studio outtakes makes Standing Room Only the perfect companion to the recent Madison releases such as Hillcrest Blues and Sunset Rundown. 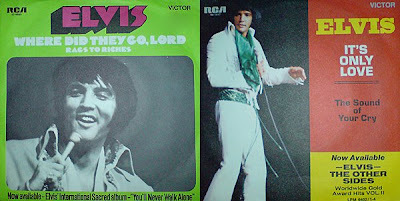 As you probably know, these bootlegs feature the mock session and rehearsal recordings for the MGM movie Elvis On Tour. Having said that, a quick look in Joe Tunzi's book Elvis Sessions III reveals that a lot of the studio outtakes on the second CD have already been released, mainly on the the box set Platinum: A Life In Music and the FTD album 6363 Sunset. That made me remember Tyggrius' comment last year that he wished FTD would partner up with iTunes or the like, and make all tracks available as individual downloads, giving fans the ability to pick which songs to buy. I gotta say I agree wholeheartedly with that idea! Finally, I don't understand why "A Big Hunk O' Love" is listed as a bonus song as it was intended to be used on the original Standing Room Only album back in 1972. Maybe you remember my post about the record store where one of the shop-windows was decorated solely by used Elvis albums and singles? I pass that store every day to and from work so no wonder the temptation finally got too strong. What better way to celebrate the upcoming weekend, I asked myself this afternoon, than to buy a couple of the singles I'd had my eyes on. Satisfied with my sound reasoning, I entered the store and asked if I could see three of the singles that were on display: "It's Only Love"/"The Sound Of Your Cry," "Rags To Riches"/"Where Did They Go, Lord" and "Separate Ways"/"Always On My Mind." I soon found out that the guy working in the store wasn't an Elvis fan, as he had problems getting the right records for me, returning with "Way Down/Pledging My Love," amongst others. But the second time around he got it right (after asking me, "Say again, Rags to what?") and after looking at them I decided to skip "Separate Ways" as it had scratches that didn't look too promising, being content with the two others instead. At home I played the singles, thinking about how it must have been to buy them when they were released. In other words, asking for Elvis' new single "Rags To Riches" and getting an understanding nod from the shop assistant who then points to a rack where there are plenty of copies of the record. And then seeing others picking the same single as yourself! Still, I had a good time listening to those 1971 singles, even if my wife shook her head in wonder when she was told I already had the songs on LP and CD. And you know what? I spotted one interesting thing: "Where Did They Go, Lord" is listed as Side 1 on the label of the record, and "Rags To Riches" as Side 2. But surely it's the other way around? A while ago I wrote about the alternate verse featured on "I'll Be Home On Christmas Day." 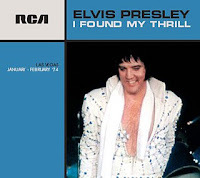 Today, listening to the FTD release I Found My Thrill from the January/February 1974 Las Vegas season, I started thinking about other versions of songs including an extra verse. Two of them can be found on the above mentioned live CD, the first one being "Spanish Eyes" sung as a duet together with Sherrill Nielsen. "Sherill, you wanna do a song with me?" Elvis asks him and together they launch into a beautiful rendition that includes the "Blue Spanish eyes, pretties eyes in all of Mexico" verse not found on the studio original from December 1973. Actually, I prefer this version, with the trumpet solo adding a more Latin feel to the song. 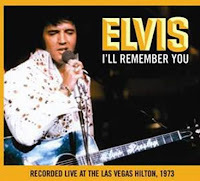 The second one is "The First Time Ever I Saw Your Face," another highlight on I Found My Thrill, dedicated to Sheila Ryan that Elvis dated at the time. This is another occasion where I think the live version is stronger than its studio companion (from March 1971), done in a more dramatically fashion. Also, the extra "The first time ever I lay with you" verse lends the song a deeper meaning. The same certainly can't be said for the next song that comes to mind, featuring an extra verse. But it's still a mystery to me why RCA chose to release the short version of "One Broken Heart For Sale" (1:34) from It Happened At The World's Fair as a single, and not normal length version (2:20). That one wasn't released until 28 years later, on the Collectors Gold box set in 1991, including the "Hey cupid, where are you, my heart is growing sadder" extra verse. Another one we had to wait for, was the alternate master of "There's So Much World To See" from Double Trouble, that first saw the light of day in 2001 on the FTD release Silver Screen Stereo. "Trains in the night, flashing their light," Elvis sings, adding both seconds and a more bluesy feeling to the song. There you have it, five versions of songs that all have an extra verse not found on the original releases. Are there more of them out there? For a while my brother has pestered me about making a guest appearance on his blog. So if you don't like it, blame Thomas! No, actually I'm very proud to participate like this. Thank you, bro! There are some Elvis fans who have other interests than Elvis, believe it or not. I have several. But it doesn't matter what it is – you can't get away from the king! 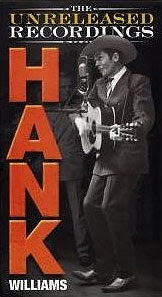 One of my heroes in music besides Elvis is Hank Williams. And of course Elvis recorded some of Hanks songs: "I'm So Lonesome I Could Cry" (fantastic Elvis version) and "Your Cheatin' Heart"(not so fantastic). The set kicks off with a splendid version of "Blue Eyes Crying In The Rain." This was written, not by Willie Nelson, but by Fred Rose who was Hanks producer and mentor. 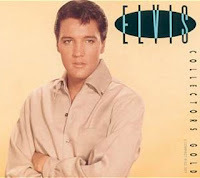 Other Elvis songs on the CD set is "Precious Lord, Take My Hand," "Have I Told You Lately That I Love You" and "When The Saints Go Marchin' In." And even "On Top Of Old Smokey," sung by Elvis in Follow That Dream for about ten seconds! (Funnily, known Elvis CD set writer Colin Escott claims in this set that Elvis recorded a song called "Softly And Tenderly." (If he did, I never heard it!) And yes, "I'm So Lonesome I Could Cry" is included, as well as "I Can't Help It (If I'm Still In Love With You)." Another interest of mine is collecting (and when I get the time, watching) old movies from the 30's. And wouldn't you know: there almost always turns up an Elvis co-star in them! For example: the yoga teacher in Easy Come, Easy Go was played by Elsa Lanchester. She was the female monster (as well as Mary Shelley) in Bride of Frankenstein from 1935. Elvis is truly everywhere! I even married a gal whose two first names are – yes, you guessed it – Swedish versions of names in Elvis song titles! And two good songs they are too: "Susan When She Tried" and "Marguerita!" The sound quality really is excellent. That was my first reflection while listening to the latest FTD release I'll Remember You for the first time yesterday. That said, this Las Vegas midnight show from February 3, 1973, doesn't differ very much from the dinner show recorded the same day and released on the bootleg It's A Matter Of Time some 16 years ago. In fact, the songs are done exactly in the same order (with the exception of "I'll Remember You" which was sung only at the dinner show and included here as a bonus song). In other words, no big surprises, but some tracks caught my attention more than others. The first one was, maybe a little unexpectedly, "Blue Suede Shoes" where Elvis actually seems to enjoy himself singing this song from the 50's. I also have to agree with the review by Geoffrey Mc Donnell over at the Elvis Australia site where he classifies "What Now My Love" and "An American Trilogy" as the two show highlights. To me they sound very much like they did a month earlier at the Aloha show. One thing I think is a little bit funny is that the CD have the same title as a song that wasn't even in the show, and that the same is true for it's "companion" It's A Matter Of Time which is also named after a bonus song. I also spotted a tiny error on the inside of the cover where "Suspicious Minds" is listed with a running time of 1:16. Before I listened to it I suspected an incomplete take but was relieved to find it ending at 4:53. Conclusion: If you want to listen to an average Elvis show in good sound quality I'll Remember You is a must. If not, you can skip it and listen to Aloha From Hawaii Via Satellite instead.